The floating PvP battle arena, Aeris Battlespire awaits you! Come test your fighting skills against other players, and conquer your way to the top! A small village on the beach, Aika makes a great vacation spot. Don't forget to bring a bathing suit and sunblock! Amityvale, nestled inside Doomwood Forest, is not exactly a hot vacation spot. But hey, I bet they have no shortage of vampires, ghouls, zombies, and werewolves. The mysterious floating city, Atrea, sits at the Anomaly. A race of stranded inter-dimensional aliens has brought their city here to escape the dangers of their homeworld! A large city, nestled into an even larger iceberg. Home to Galanoth, the Dragon Slayer. Dress warm! 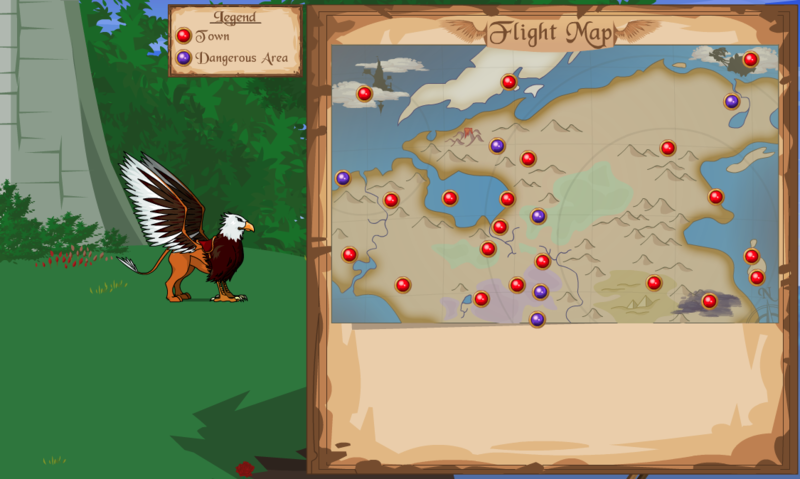 The airborne stronghold of the Order of Dragonlords! Flying high above Lore, DragonsGrasp is a force to be reckoned with. An Inn, inside Doomwood Forest, Hunter's Paradise is a haven for adventurers. Karina here is always looking for new hunters as well. Far beneath the waves of Falconreach Bay, The Locker is a town built from the remains of a ship graveyard. The murky deep awaits you. Lymcrest, a dwarven mining town, is sitting on a labyrinth of dungeons. How low can you go? Moonridge, a merchant-friendly town along a busy trade route. Peaceful, yet it has its share of problems being on the edge of Doomwood Forest. Home to the honorable Knights of the Pactagonal Table, Oaklore is a military outpost under the reign of the good King Alteon and commanded by Captain Rolith. On the Southern part of the Isle of Sho Nuff lies the pirate town of Osprey Cove. Only the roughest traveler would dare to venture here. Unless they wanted to be a pirate, in which case this is the place to be! The floating town of Popsprocket! Built and inhabited by gnomes, this town is full of surprises. A cruel desert under the scorching sun. The Sandsea is ruled by Sek-Duat XV, and its people live in fear. Shadow of the Wind Village rests on the Northern half of the Isle of Sho Nuff. This town is quiet. TOO quiet. Which is probably why it is home to so many ninjas. The home of the Priestess, Lady Celestia. She is an expert on dragons, dragon magic, and tea. Swordhaven, the grand capitol of the kingdom of King Alteon. Verteroche Crossing, a quaint town with kind people. There are caravan and boat chartering services available. 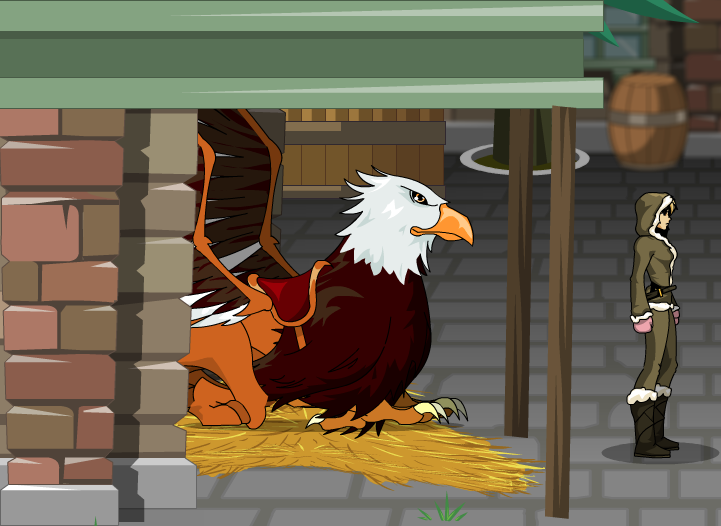 Hidden in the mountains to the North-East, Willowshire is well-protected town with a BIG problem. 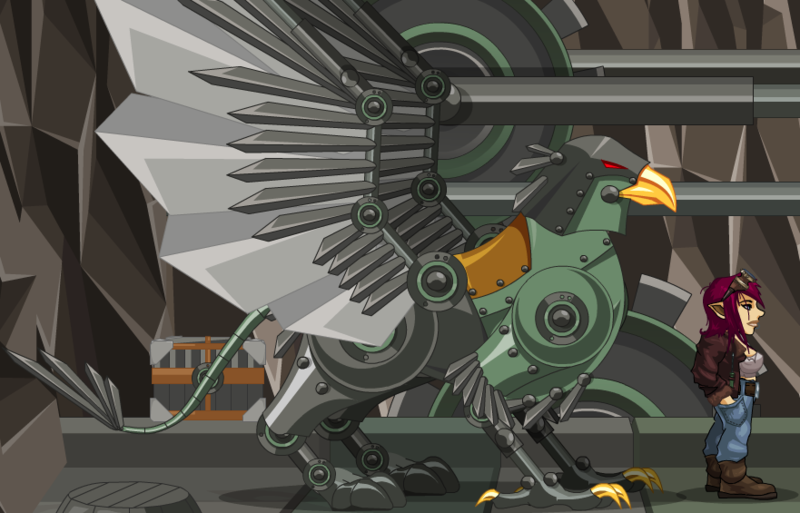 A big, flying, fire-breathing problem. The ruins of a once great paladin stronghold, Braughlmurk Cape now just holds dusty dungeons and tainted shards of once powerful items. Ennwen might able to use those shards to make special magical weapons more powerful. Deep in the heart of Doomwood Forest lies.. The Necropolis, where brave paladin Artix battles the forces of darkness! Riverine Keep has long since crumbled away, but amongst the remains lies a passageway to an underground labyrinth! Many treasure-hunters venturing into its depths were never heard from again. Also referred to as The 100 Room Dungeon. A massive ruin of a city, nestled South of Doomwood Forest. Hidden by dense forest, it is yet unexplored and holds many treasures... if you are brave enough to find them. On the South-East edge of Maguswood Forest is an area named Surewould. Beware of bandits, monsters, ebil moglins, elementals, and more bandits! The home of Warlic, the blue mage. Brunhilda: Greetings, hero! 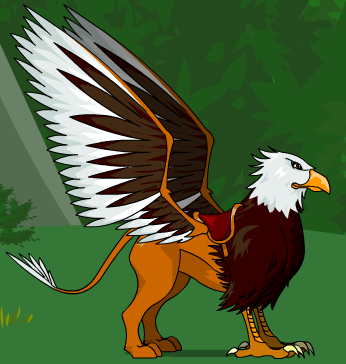 We raise the worlds finest gryphons here in the northlands! Where do you wish to fly? Airheart: Hi there! I almost have the navitron working on the mechagryphon, but that's why gnomes invented parachutes! Where do you want to go? 1. Previously accessible via the Falconreach Newsboard. -- Jay for entry rewrite. -- Peachii for original entry rewrite. -- Leon ShadowHart for access point. Once a great paladin stronghold, a great war between paladins and shadow necromancers poisoned both land and sea. Now nature is slowly reclaiming it, but ghosts of former occupants still stand guard! Let the moon light your path as the creatures of the night serenade the violet landscape. Ominous laughter mingling with scurrying feet behind the brambles will make you wonder if the goosebumps on your arm is caused by a chill in the air or the howl of wolves. The local mountains hold a close affinity to the elements. It comes to no surprise then that several races close to the elements including the Elemental tribes make their home in the mountains and foothills of the locale. Verdant trees backed against high peaks, bosky shrubbery surrounding a mirror lake. Peaceful are the glades abundant with magic, warmth and protective security. The Rose's presemce is not found in this zone though their influence is not entirely absent. Home of the human capitol and the fairies court. 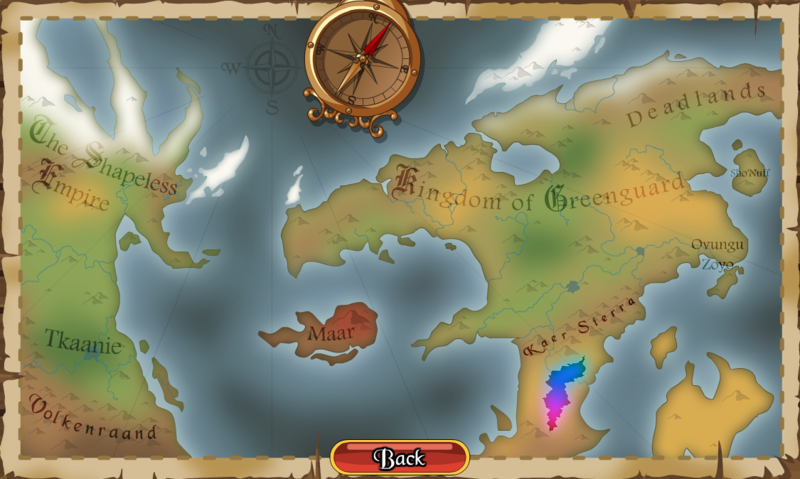 Greenguard is the political heart of the kingdom. A fertile land, dotted by farms and woods. This beautiful countryside is plagued by bandits and the oppressive Rose soldiers. Boxforts, waterfalls and scampering sneevils are around every corner. The novice adventurer can gain much experience and gold here! These woods also have a sense of mystery about them. Stand upon a precipice and enjoy the beautiful blooms of the dale below. Gorrilaphants roam and moglins play, the lush pathways are a heartening find. You can see a tower's spire in the distance and the laughing song of a fife! Sun, sand and... even more sun and sand... The Sandsea is home to unending, blistering hot sands where sandstorms and mirages may lead the unwary wayfarer to their untimely death. Once home to a great kingdom now remains only ruins, swallowed by the sand. A millennium ago, there occured an elemental war so terrible that the northern reaches of this land were left so desolate as to bear its namesake. Tis a lonely country explorer, and no place to rest easy. Best to keep moving. This extremely windy and rough region is almost uninhabitable. If you believe the rumors, raging storms and countless tornadoes are a result of an everlasting curse, brought by the gods upon this land. Another rumor speaks of cities in the sky, high above the cloud line, riding on massive hurricanes. Native people who "do" live on the ground level have learned how to tame the winds and build windproof structures. Spilled ale, smokey incense, hearty cheers of captain and crew along with fleeting shadows fill your senses. Was that zinging sound you heard the result of rigging sliding up the mastt or the whisper of a katana being drawn? Maar is a smoldering, smoking mass of rock and glass that lies in the middle of the sea between the two land masses. The Five Sisters stand tall over glittering plains of obsidian glass and belch fire and smoke into the reddened skies every century or so. The capitol of the Shapeless Empire, Nieboheim, is the pinnacle of architectural heights. Magic literally flows through the streets of the city~from the stones that pave the roads to the grand spire that towers above all. This extremely efficient city houses people from all over the empire, selected by the Magesterium themselves. The dominant, and only, religion is the Shapelessness. Once a battleground between Volkenraand and The Shapeless Empire, Tkaanie has seen better days. Filled with large forests, ruins of old forgotten towns and newly established villages, this region is a mecca for settlers and adventurers.